No matter what people may tell you, there is a way to get through your 9 to 5 work day – and all you have to do is embrace it. Now is the time to make a stand and focus on what really makes you happy, and what you want from your career. Make your workplace your own, make friends in the office, play pranks on your co-workers, and wear whatever the heck you want. Need some inspiration? 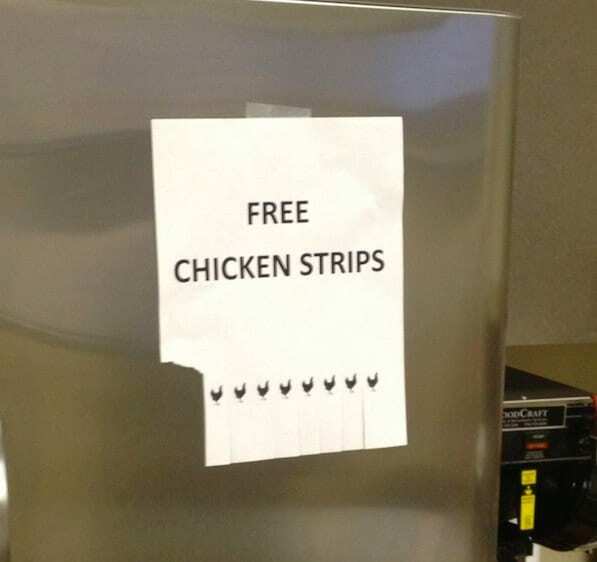 Well, check out these 31 hilarious office employees embracing the office life. It doesn’t seem to matter how modern and luxurious an office is, it’s inevitable that something will break at some point. It might be the photocopier; it might be the hand dryer; or it might even be the coffee machine. Although this coffee maker was not completely unusable, it was definitely NOT hot. 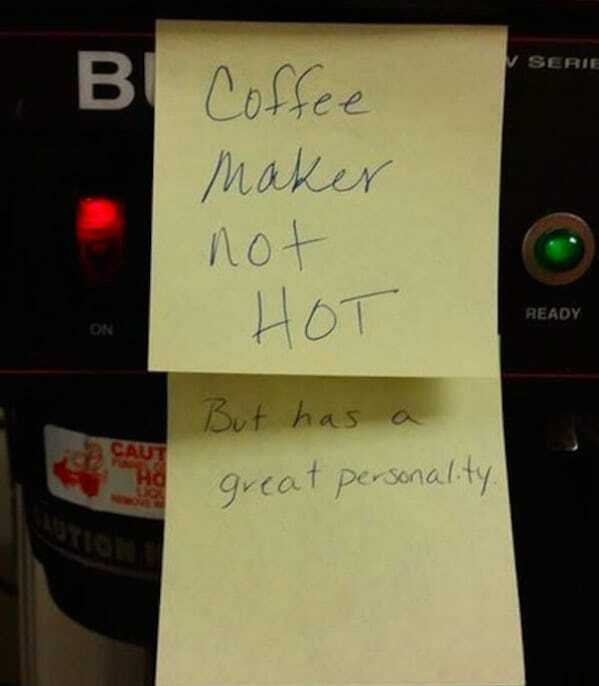 However, one employee couldn’t leave the coffee maker feeling so unwanted. Thankfully, everyone now knows that this fairly average-looking coffee maker has a great personality. Sometimes, managers like to fill their offices with confidence boosters and posters that will motivate their staff. These posters might delve into a few problems they’re having in the office – but in a nice way, of course. So, this manager tried to tell their staff that they were way too sarcastic in a calm and professional manner. Unfortunately, they didn’t spell-check the poster before they stuck it up on the wall, which meant it was just asking for a sarcastic reply. If you’ve worked in an office before, you’ll know that the bathroom is a sacred place. The workers want to feel comfortable enough to use them during the day, and the cleaners want to make sure they stay clean and tidy. Some people in the office just don’t understand that things are yours and only yours. Just because it’s in a communal space doesn’t mean that it’s there for everyone to use. The owner of this carton was obviously fed up with others using their milk, so they went to some pretty extreme lengths to stop it happening. 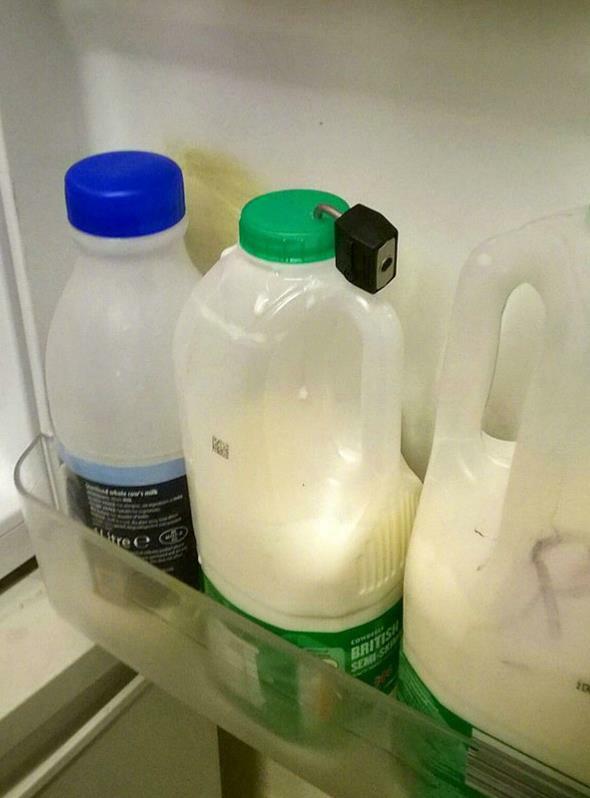 A dedicated colleague could probably still find a way to get the milk out, but we appreciate the effort this person has gone to just to protect their property. Cardboard cutouts make for excellent pranks, especially when they’re of someone as hilarious as Mr. Bean. 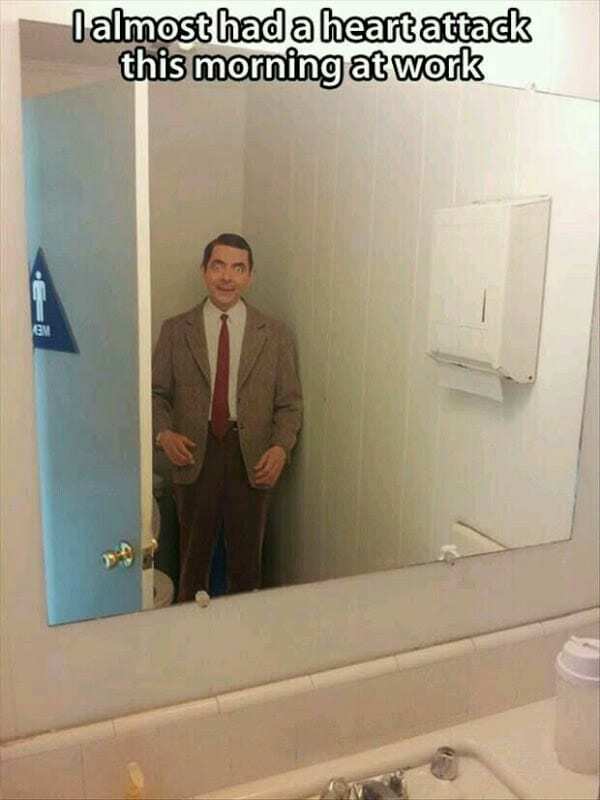 This is the last thing someone expected to see when they went to the restroom at work, so it’s no wonder that the shock almost gave them a heart attack. Mr. Bean’s wide eyes and disturbing smile are actually quite terrifying to look at in a tiny bathroom at work. We wouldn’t be surprised if this poor employee had nightmares after their encounter with this cardboard cutout – we certainly would. No office would be complete without a resident funnyman or woman. This person aims to constantly make people laugh and lift the spirits of the employees who would rather be anywhere else but there. However, constantly finding new and hilarious material can be tough, so they have to be a bit more inventive. 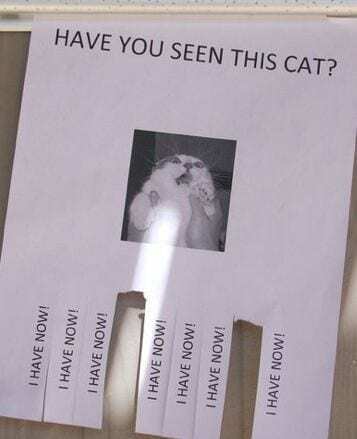 We have to give this joker credit for their creativity in making this epic “Have You Seen This Cat?” poster, but we’re pretty upset the tags don’t say, “I have meow.” That would be purrr-fect. Although we like to think we have a lot of power in the office, the truth of the matter is that everything goes through your boss. Everything from the work you have to do, to the amount of free tea and coffee allowed in the break room, to the amount of printing you’re allowed will have to go through those at the top. However, there are some people who just hate being told what to do, and will do anything to stick it to the man – just like this guy. 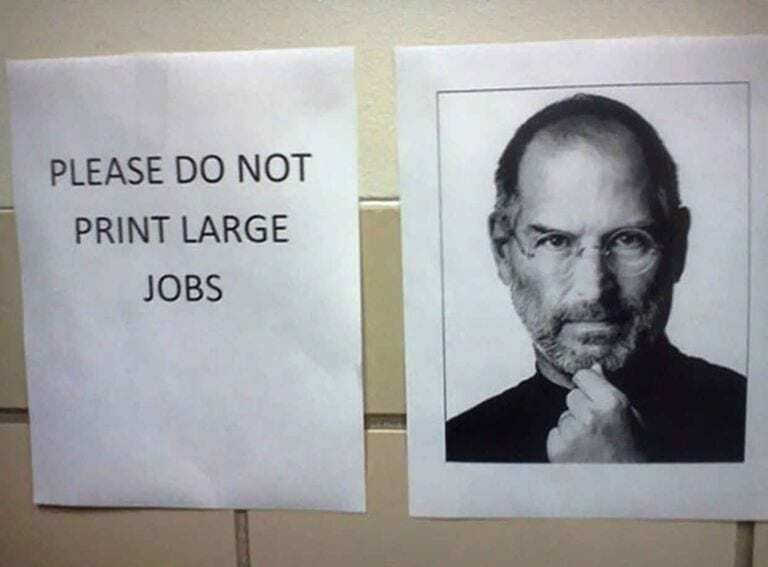 He wasn’t allowed to print large jobs, so that’s exactly what he did. Office politics can be a minefield to navigate, especially when it comes to lunchtimes. How one person would store their food is not how someone else would. How one person would clean the kitchen is not how another would. How one person would throw out their trash is not how the passive aggressive co-worker would, and so on. 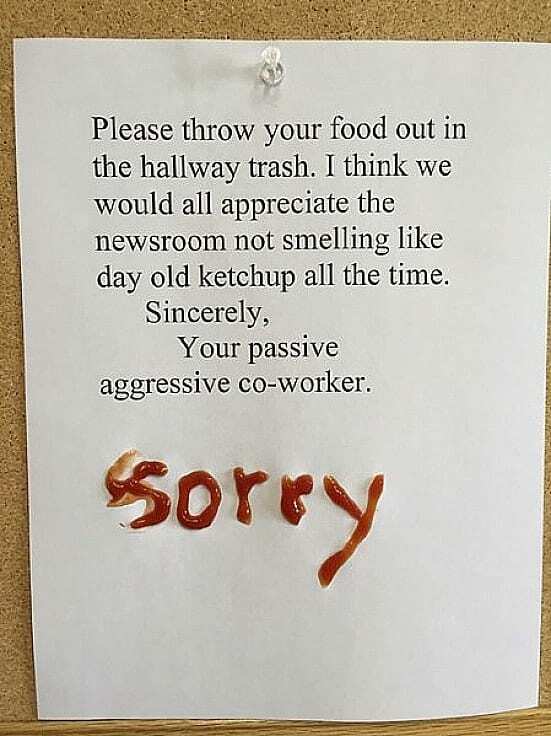 Needless to say that this causes tension, but at least this person had the decency to apologize… in old, smelly ketchup. You can never quite rely on office equipment; even brand new bits of tech can go wrong at the worst of times. If you’re in a rush, or you have a big presentation to prepare for, this isn’t ideal. However, you’ve sometimes got to have a bit of humor about the work environment – because after all, it’s not your problem! 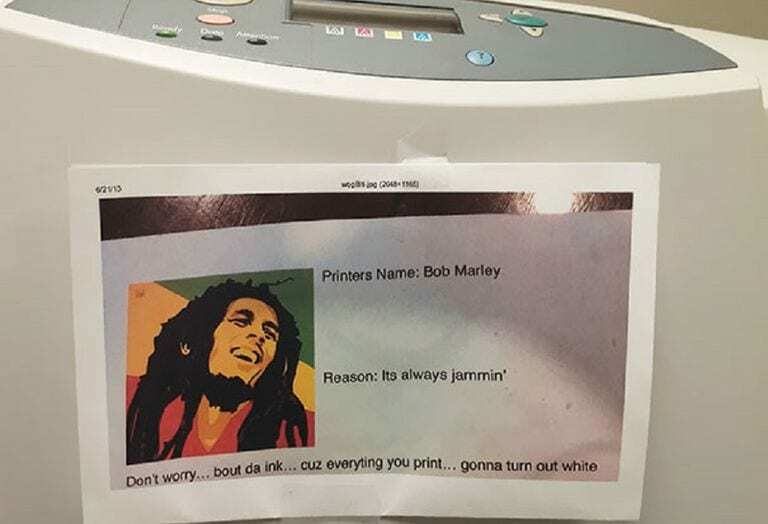 So next time your printer jams, laugh it off, print off a picture of Bob Marley, and let the world know that everything you print…gonna turn out white. When you first start a new job, you are given rules and regulations to adhere to, and even a loose timetable to stick by. Of course, you know what time you should get there in the morning to avoid being late, you know what time to have lunch, and you know what time to leave in the afternoon. 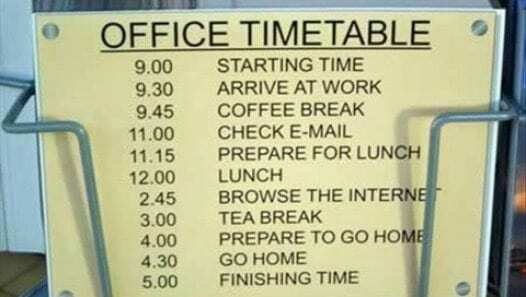 However, after a few months, these rules seem to slip, and you create your own timetable… Just like this one. If you’re the kind of person that gets bored easily, you can probably find it tedious to sit down in the same uncomfortable chair and do the same job every single day. Unless you work at Google HQ and have a giant slide in the office, you will normally need to create your own entertainment – without being spotted. The person behind this poster was obviously having a slow day at work, and thought their hilarious joke was a lot funnier than it is. Only two takers? Maybe the others were just chicken. Although most of us know how to behave in an office environment, it can get pretty difficult when different departments are involved. Despite that, we’ve personally never heard that programmers are particularly skittish, or that the last thing you want to do is make them cry violently. 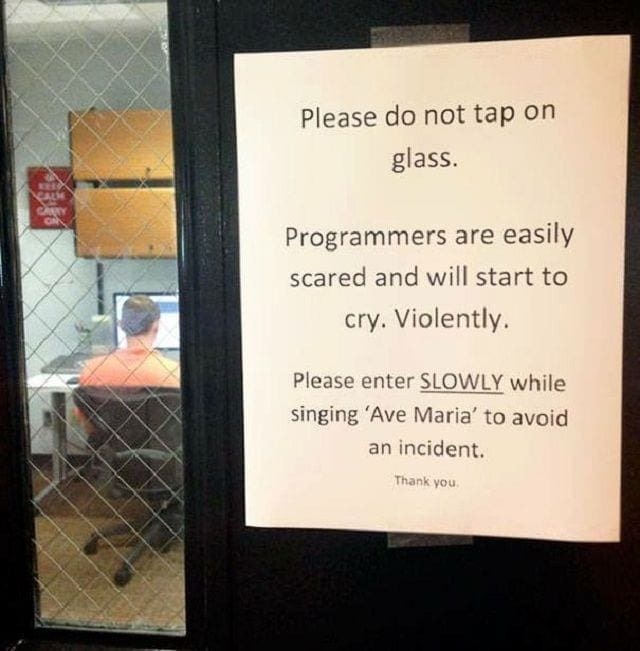 We like the idea of singing “Ave Maria,” though. Not just when it comes to programmers, but in general. So if you hear the hymn sung softly from behind you, just know that we’re coming. There is always one employee in the office who likes to show off their pride and joys. They might bring in pictures of their family vacation and set up a slideshow for everyone to watch, they might bring in their classic toy car collection, they might tend to a whole forest of trees and plants on their desk, or they might bring their cat obsession to work with them. 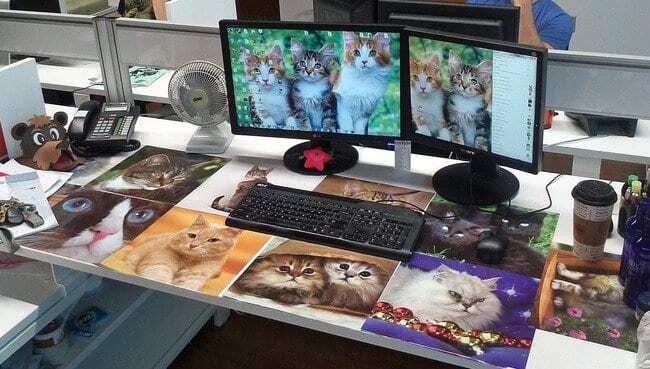 You can tell this worker has pawfectly placed those photographs on their desk and made sure they had the best screensaver known to man…and felines. There are some offices that have more men than women, and there are others that have more women than men – that’s just the way it works. 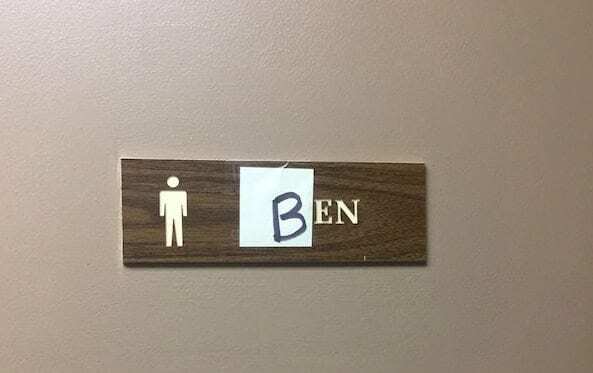 Nevertheless, employers are required to provide both male and female washroom facilities, which has worked in Ben’s favor. As the only male in an all-female office, he has the whole of the male bathroom to himself. Because of this, he decided to do a bit of redecorating and make it truly his. We wouldn’t be surprised if his co-workers responded with a move toward co-ed bathrooms. For most people, the prospect of working in an office is incredibly off-putting. Instead, they wish they could work in the comfort of their own home, with their own four walls around them, their fireplace, their kitchen, and their very own, beautiful flowerpots. Yet, what if there was an option for bringing your home to your office? Well, this guy has absolutely nailed the home sweet home vibe in his office block. With windows, doors, a chimney and even a door knocker, he is really living the life of luxury. We are always on the lookout for ways to make the office experience a little more joyful. Many office employees toy with the idea of getting an office pet to keep their spirits high and give them a little boost when morale slumps low – but bosses rarely agree to this request. 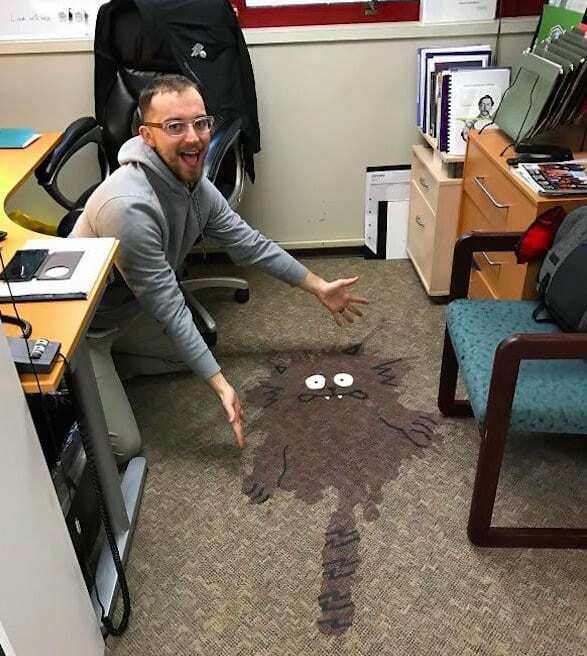 So, this worker decided to make his own office pet with what we can only hope is a coffee stain on the floor. They say dress for the job you want, not the job you have. So, if you don’t want to be a computer programmer sitting through the third morning meeting of the week, make your feelings known – loud and clear. Long gone are the days of sitting in stiff shirts and pants through the board meeting – this is the 21st Century! 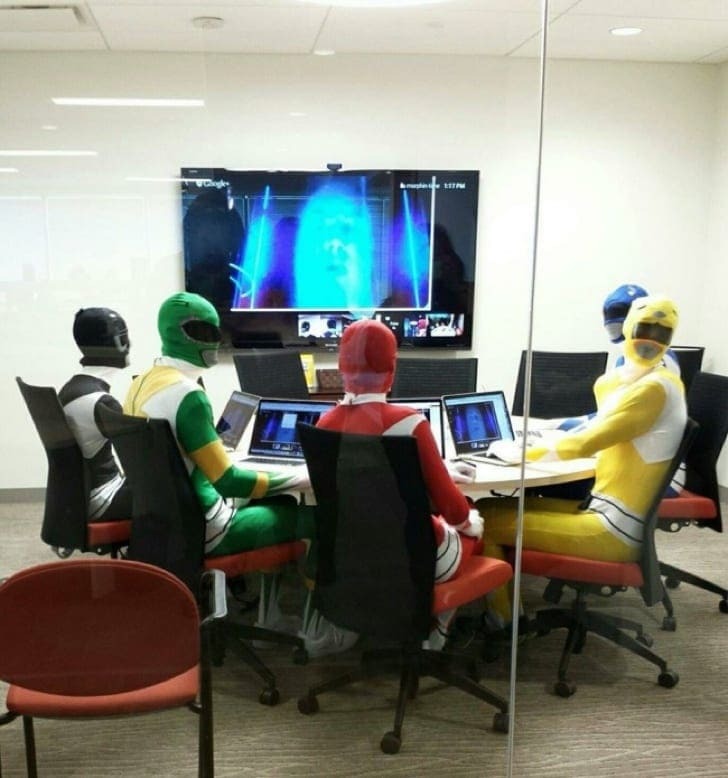 If you want to come to work dressed as a Power Ranger, then go for it. Luckily, everyone in the meeting had the same idea. 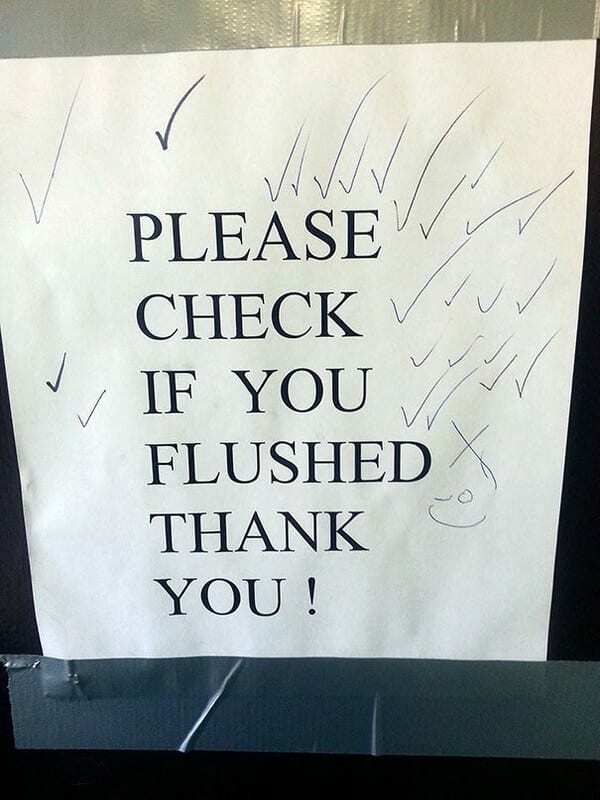 Although this passive aggressive note was approved by the manager, it definitely wasn’t proofread by the management. Of course, any little slip-up will be ripped apart by the staff, and we can safely say that’s happened. This prankster has not only picked up and highlighted on the pretty blatant spelling mistake, but they’ve also broken the rules of the note. 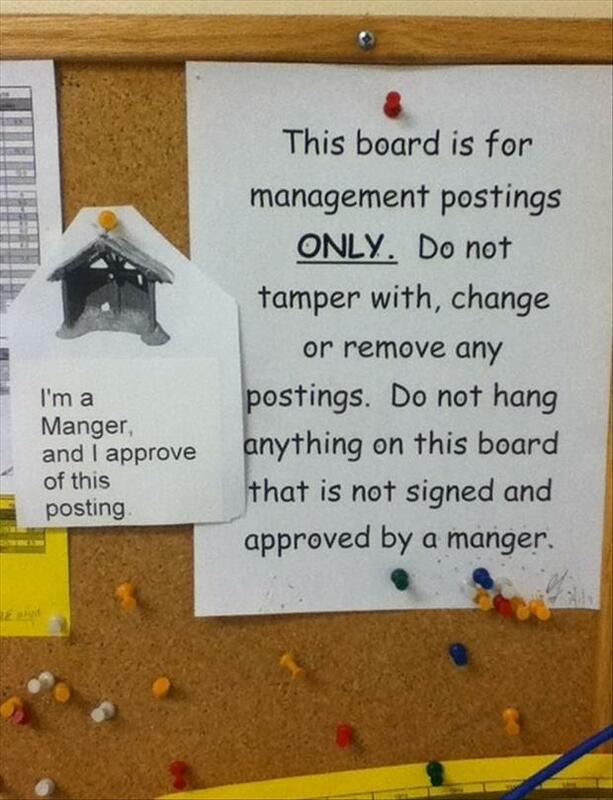 Someone is going to be in big trouble when the manager – sorry, manager – works out who was behind this. When you’re staring at a computer screen all day, it can sometimes get a bit too much. When your eyes begin to get tired, and your brain needs a break, you need to find something to occupy your time away from the computer screen. 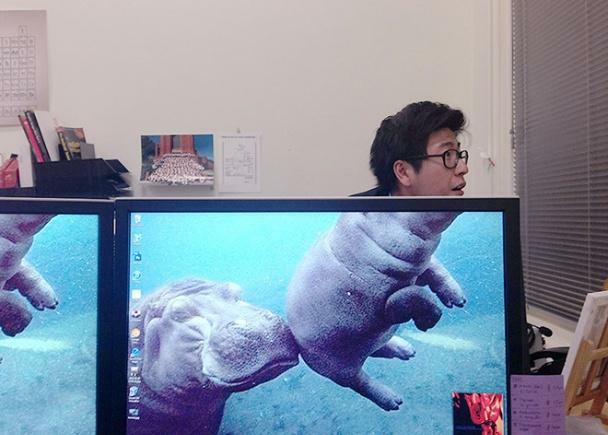 These guys found the perfect way to take a break from work, in the form of an adorable little human-hippo. No longer do they have to be in front of the screen, they can be behind the screen. And part hippo! It’s a win-win. If you work in an office, you’ll know the best part of the day is lunch. This is the time where you’re off the clock, you don’t answer to anyone, and you can do whatever you want. This person took that freedom to a ‘hole’ new level – and we love it. Instead of sitting on social media while eating a sandwich, they decided to make a little fun for themselves and install a golf course. Because why not, right? This way, they can get in nine holes before the day is out. 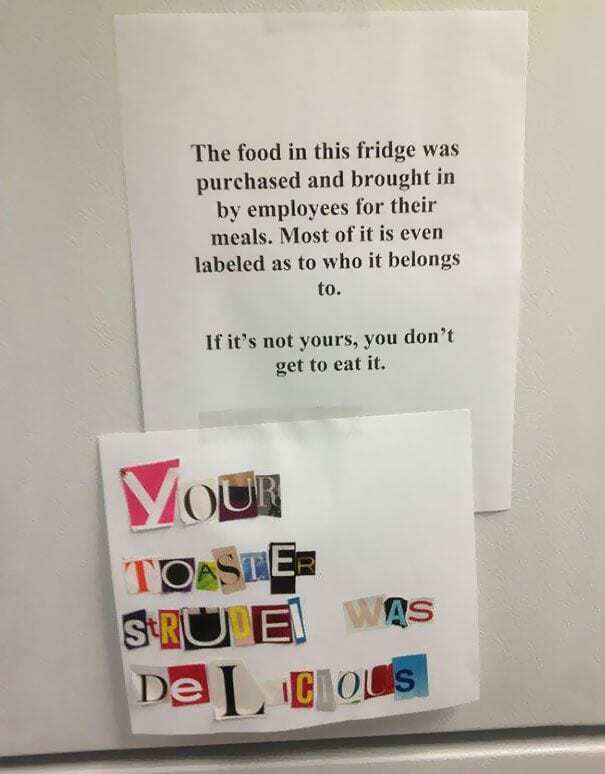 No matter where you work, there will always be someone in the office who is out to steal your food. Whether it’s a little bite from your sandwich, a little scoop of your yogurt, or a sip of your milk, it’s not cool to find your beloved lunch has been eaten. 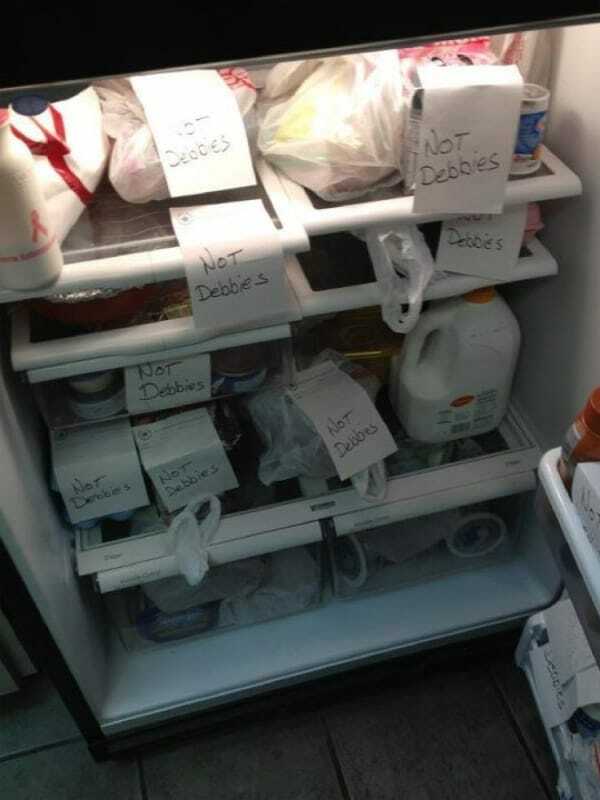 Most of the time, you can’t tell who the culprit is, but in this office everyone knows it’s Debbie. As such, they’ve all labelled their food. You made your bed, Debbie. But you better not eat it. Strike up a friendship with one of your co-workers, and before you know it, you two might start to be regarded as each other’s eyes and ears. You will constantly be asked where your co-worker is if they’re not at their desk, and the same will happen the other way around. 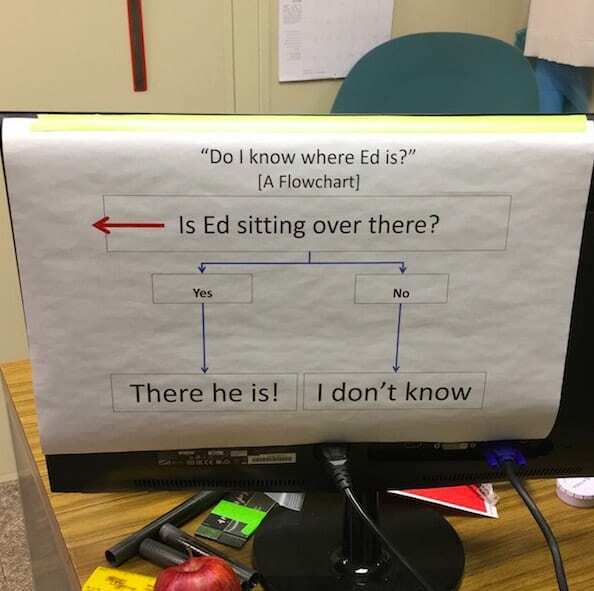 This worker got so fed up with answering the same question over and over again; they created a nifty little flowchart to save time answering the questions. When you spend all day in your place of work, it’s important to bring in things that make you feel more at home. Many people do this by drinking from their favorite mug – which they HOPE no one else will use. However, unless you keep it under lock and key, there’s no way to stop others from having a cup o’ java in your mug. 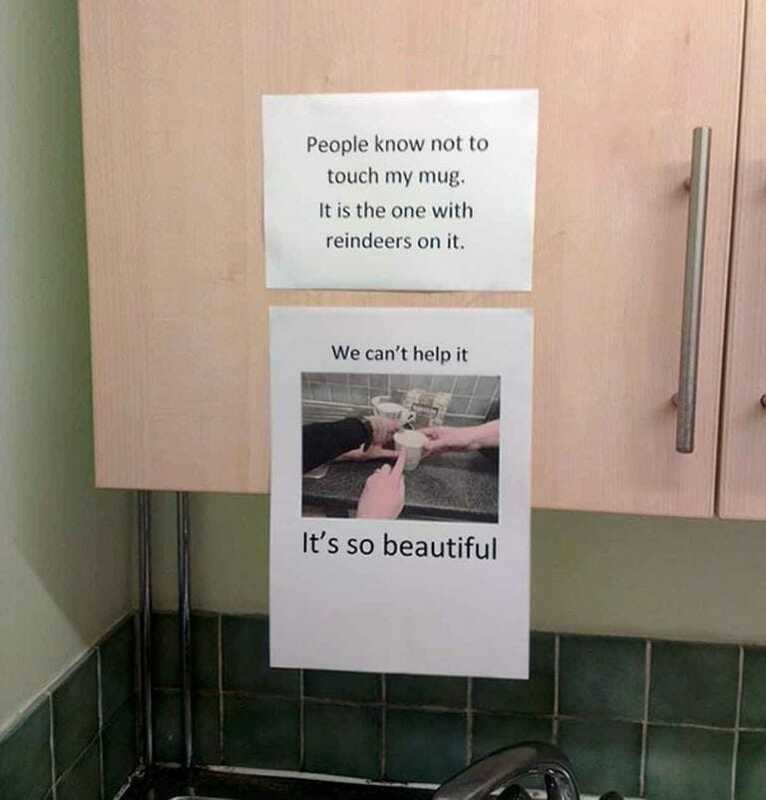 This worker was incredibly attached to their reindeer mug they even put up a sign, but that didn’t stop them. After all, it’s so beautiful. 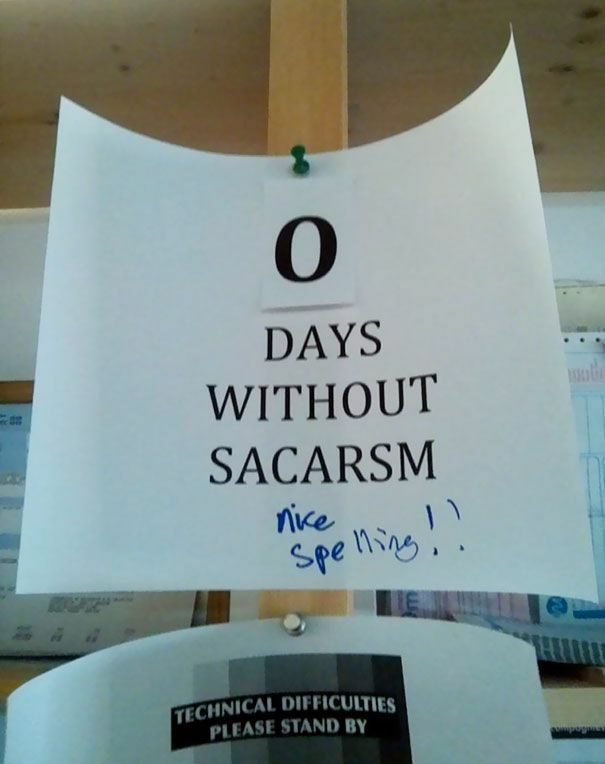 This group of workers got so annoyed to see their boss had put up a ‘no thumbtacks in wall’ poster using thumbtacks; they just had to sarcastically hit back and point out the hypocrisy of the note. 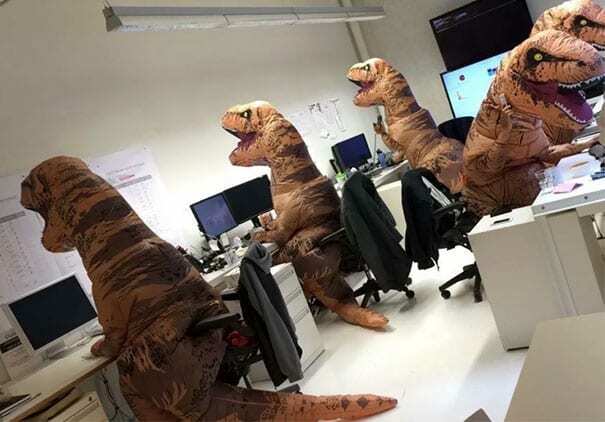 After all of their hard work, this group of employees decided to have a little fun and start a new fancy dress trend in the office. Although they didn’t get the memo that they were all supposed to wear something different, this is one room we would love to walk into. We can’t imagine it’s very easy to actually do any work when you have tiny T-Rex hands, which just goes to prove that dinosaurs would never last in this day and age. When this employee was a young boy, all he dreamt of was becoming a knight, fighting dragons, and saving princesses from high towers. However, once he realized that becoming a knight required far too much training, he opted to work in an office instead. 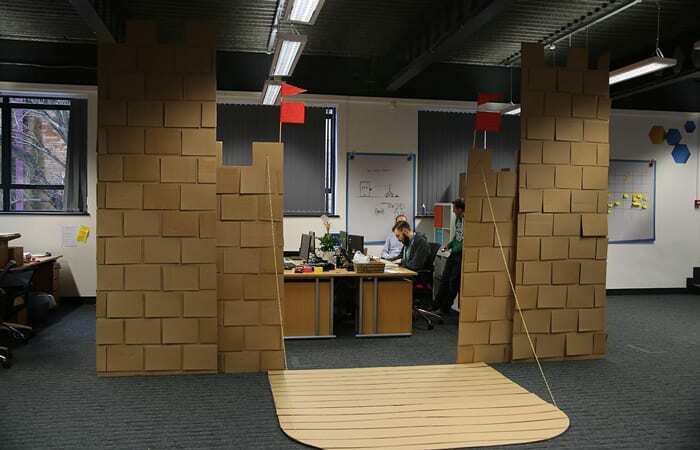 He didn’t let the dream totally die, though, as he decided instead to build his own castle, complete with a drawbridge, in the middle of the office. Now he gets the best of both worlds! When you’re doing the same thing day in and day out, you need to mix things up a little, and you need to add a little fun into the groove. But how do you do that? 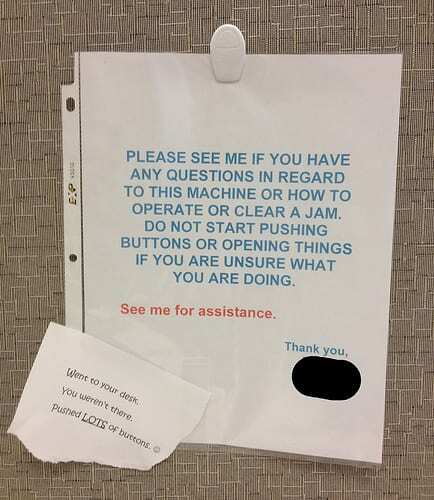 Well, in recent years, one of the most popular office pranks involves a “voice activated” sign. 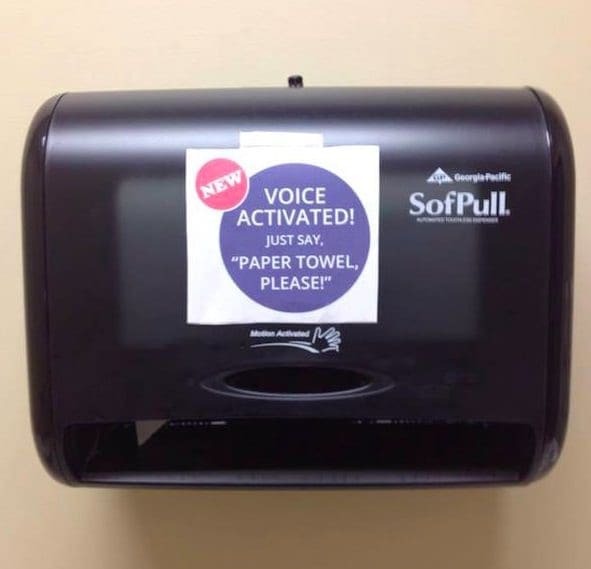 We suppose it’s not completely unbelievable to think of a voice-activated paper towel dispenser or photocopier, and there will always be a few people standing in front of this thing, shouting “paper towel, please!” over and over again, waiting for one to magically appear. 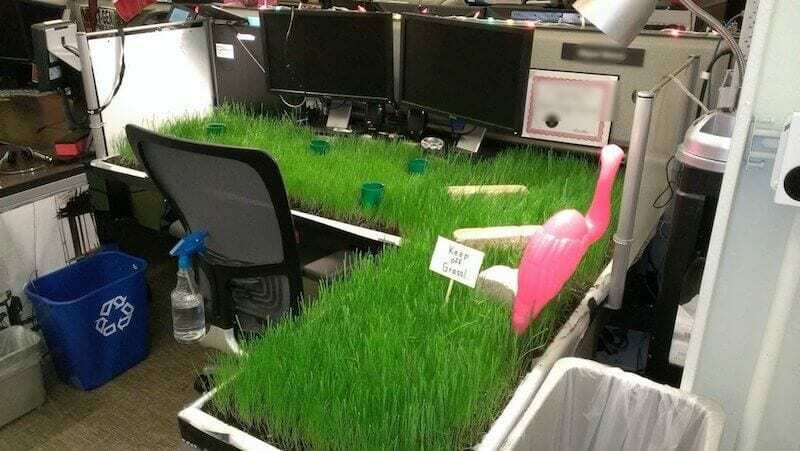 We all want to work in the kind of office that lets you have free reign with decorating your cubicle. It’s your space, which means you can do what you want with it – and add in a little bit of your personality to make it feel more like home. 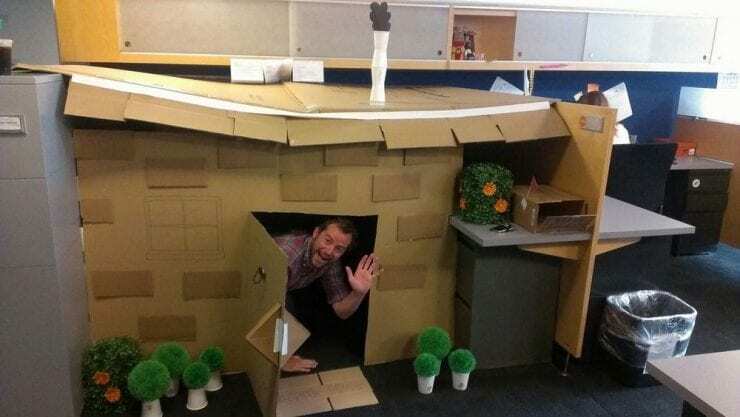 Although we’re thinking of a few posters, this person took it one step further and built their own office yard. Whatever floats your flamingo. If you work in a typical American office, you’re probably surrounded by cubicles. 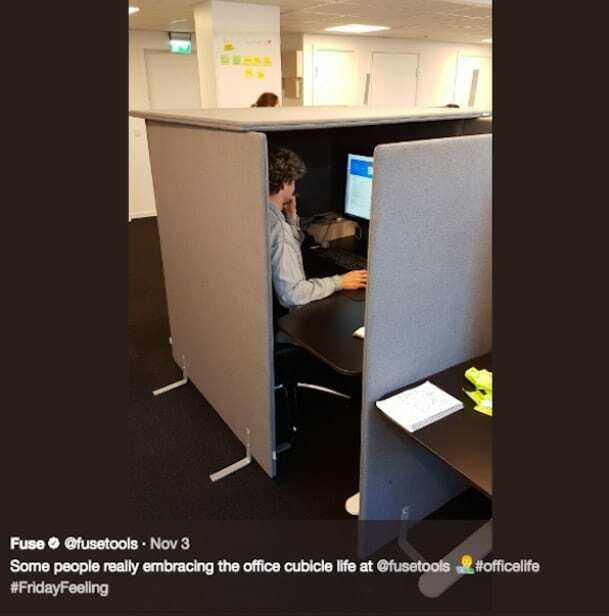 These boards are supposed to make you feel like you have your own personal office space – but in reality, they just make it difficult to chat with your fellow office friends without being caught. However, some people really like having their own private office space – like this guy, for example. Now he can work in peace, without the fear of distractions all day. Have you ever worked in an office where you bring in lunch, and it disappears? It seems to be commonplace around the country as if some people just forget what they brought in and so opt for the tastiest looking tuna sandwich in the fridge. The easiest way to differentiate between everyone’s food in the communal refrigerator is to write your name on all of your foods. However, some people don’t quite grasp this way of life – and Kevin had to pay the price. In every office there tends to be someone who is the go-to person for everything. The printer is broken? Go to them. Office drama? Go to them. Organizing an office event? Go to them. But what happens when that person goes missing? Who are you supposed to talk to?! It turns out, these employees really missed their go-to person… Like, a lot. So much so, they had to leave little notes in the hope that person would return. We hope they came back! Sometimes other people in the office have food that’s too good to resist. You know that you shouldn’t eat it, but if you just sneak a bite or two then no-one will notice, right? After all, how can you say no when there’s pizza involved. Unfortunately, this individual wasn’t quite sneaky enough. Their perfect plan was quickly seen through by one of their colleagues. 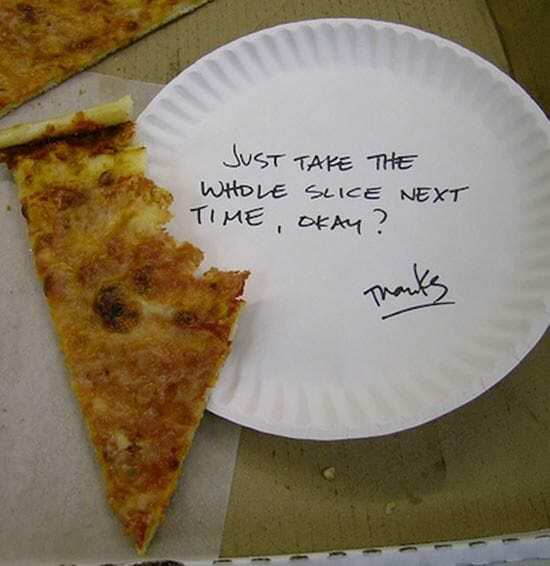 At least whoever wrote the note permitted them to take the whole slice next time, so that’s a bonus. Sometimes your office needs a bit of brightening up, especially when it’s someone’s birthday. Many will blow up a few balloons, maybe put up a banner or two, but not here – they’ve gone the extra mile. 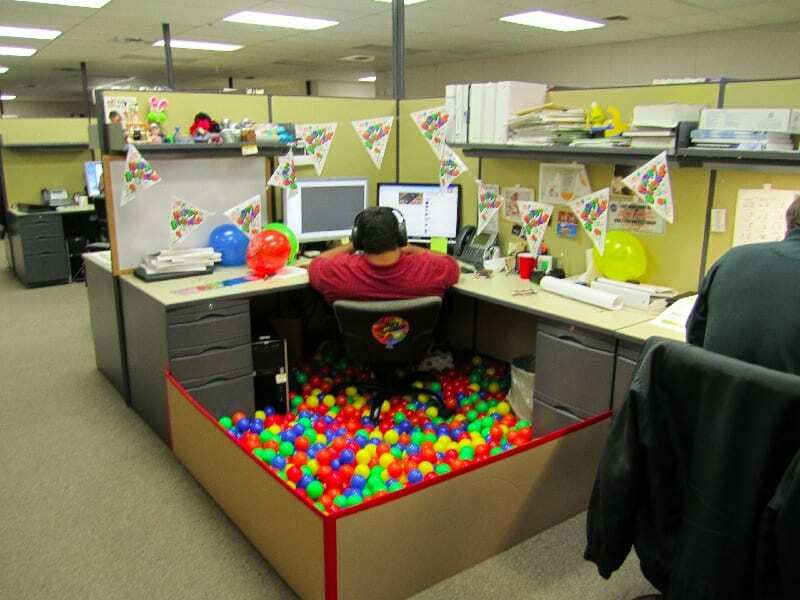 Now this worker can celebrate their birthday surrounded by plastic balls. What better way to forget you’re at work than to feel like you’re back to being a kid. It might even help to increase productivity. Google built a ball pit in their office and look how well they’re doing. They’re obviously onto something. We can’t say we’ve ever seen a whole drawer dedicated to plastic spoons, but obviously, some offices really love eating jello. 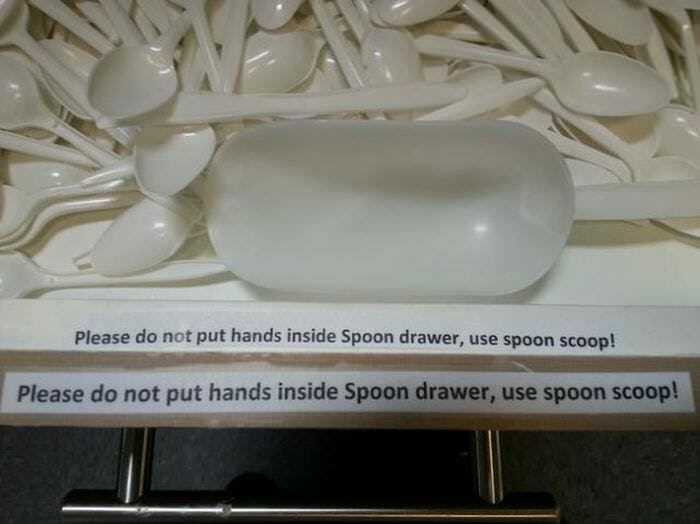 They have so many spoons to choose from, yet they don’t want any employees putting their hand in the drawer. We’re not sure how dirty they think everyone’s hands are, but at least they’ve provided this handy scoop to make getting a spoon… easier? This looks a bit like a budget fairground game where the ultimate prize is a spoon to eat your dessert with. Would tongs not have been better? 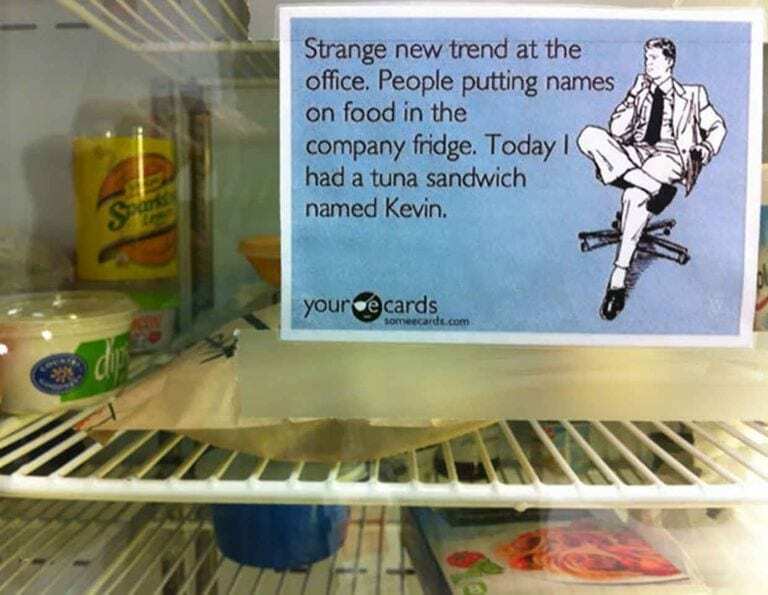 People take their colleague’s food out of the office fridge all the time. It doesn’t matter how much effort someone puts in to show that the food belongs to them, they still face the risk of losing their lunch to the wandering hands of other workers. 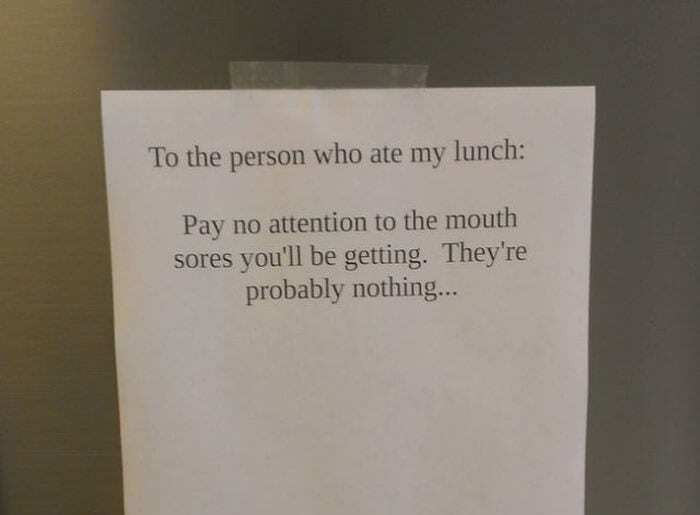 Workers at this office were getting fed up with others eating their food, so someone put their foot down with this note. Unfortunately, the person responsible for stealing the food responded in kind with their own note, and they did it perfectly. When you’re surrounded by cubicles all day, there’s not much to look at. You want a little excitement in your office, so this employee found a way to mix things up. 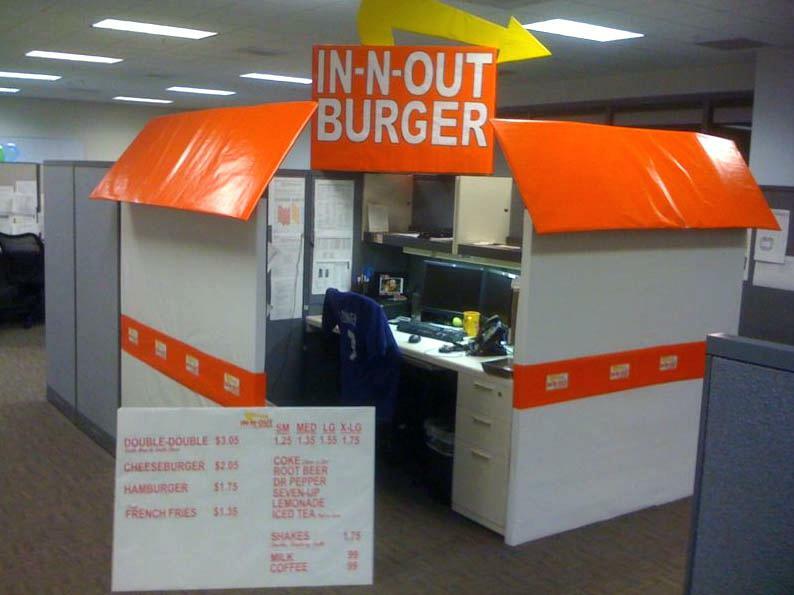 They designed the outside of their cubicle to look like a fast food joint so that whenever anyone needed to talk to them, it was like they were going to order food. It’s a great way to change up the office environment, although we can see it making a lot of workers hungry for lunch before it’s even midday. 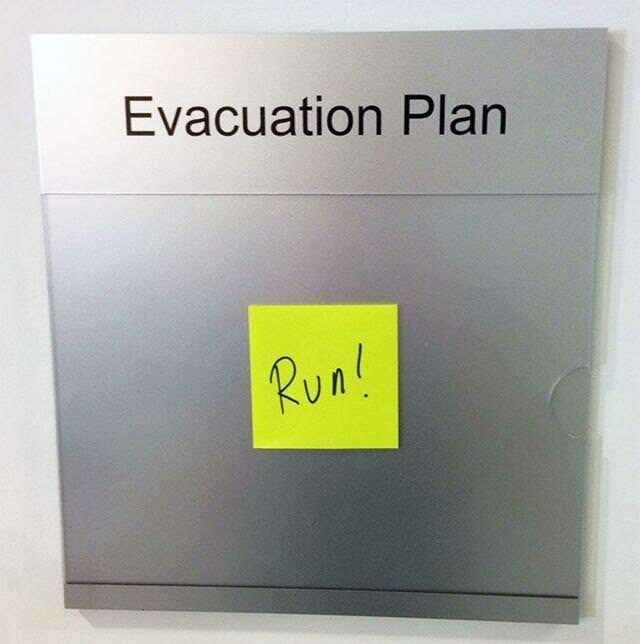 You should always be prepared if you need to suddenly evacuate the office for any reason. Fires can happen, and it’s important that everyone in the office knows what to do and where to go so that you all get out safely. It’s normally recommended that you leave in a calm, controlled manner, but this office has other ideas. Management has clearly forgotten to put up their evacuation plan, so a worker decided to do the job for them. It’s pretty self-explanatory, but we’re not sure if it’s very helpful. When something doesn’t work in your office, it can be a real pain. You want everything to function like a well-oiled machine, so once something stops, everything gets thrown into ruin. This office’s tap – a vital source for brewing everyone’s morning cup of coffee – has been turned off due to leakage, and it’s workers aren’t happy. 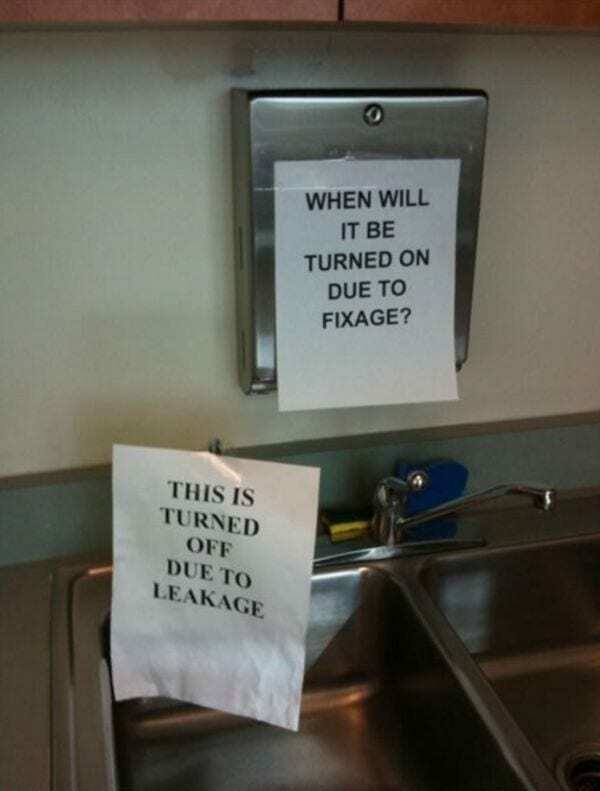 Judging by the tone of the note they left, we think that maybe this tap hasn’t been working for quite a few days now. It’s definitely in need of fixage. Nicolas Cage has become one of the world’s greatest memes just for being himself. 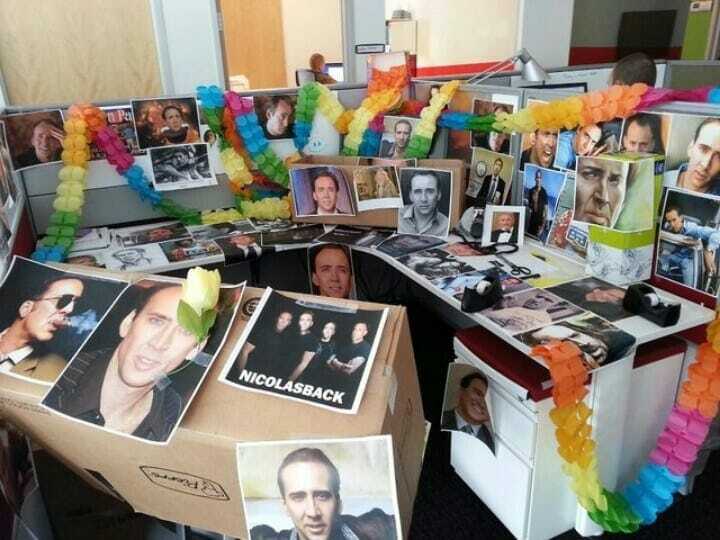 When this worker went away on holiday, their colleagues decided to turn their cubicle into a shrine devoted to the great actor. They were very thorough in their efforts, including transposing Cage’s face onto a picture of Nickelback, and we’re sure that once this employee returns to work, they’ll be grateful. We definitely can’t see them wanting to tear all the pictures down, because who doesn’t want to stare at Nicolas Cage all day? When there’s a gadget in the office that requires a lot of technical skill to use it, you don’t want everyone else messing around with it. We’re assuming that this machine isn’t actually that hard to use, but if something goes wrong with it, you want someone who knows what they’re doing to sort it out. Unfortunately, that person wasn’t at their desk when the problems started happening, which made their note entirely redundant. At least the person needing help informed them of this before they started pushing LOTS of buttons. It’s an oldie but a goodie. 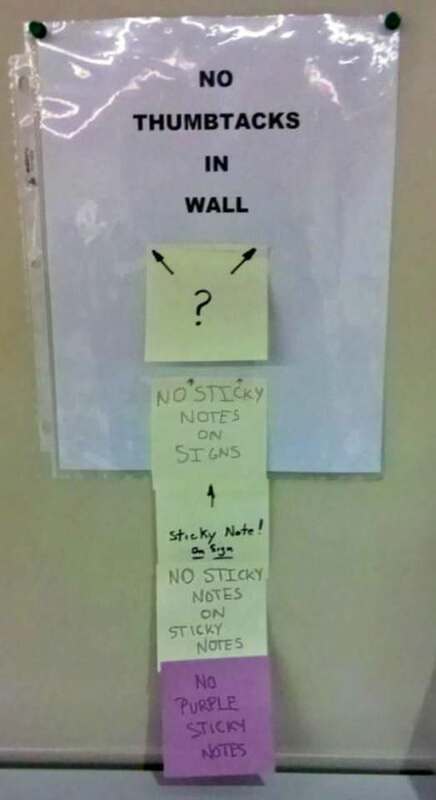 There’s no better prank to play on a fellow employee than to cover their workspace in post-it notes when they aren’t around. They’ve done a great job of color coding and making it all look so neat, so props to them. 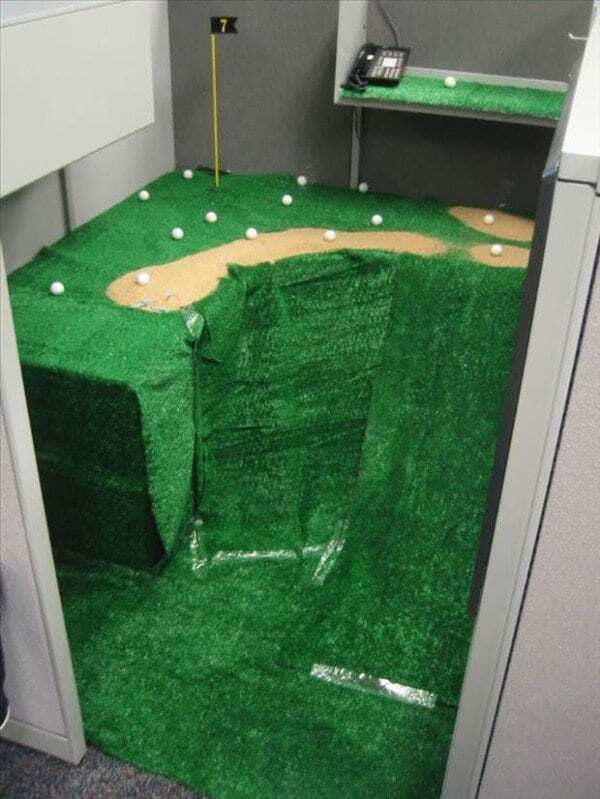 If the user of this cubicle is away on vacation, then they’ve got a big surprise waiting for them when they come back to work. We just hope they leave it as is. All those post-it notes could come in handy on the job. Some people don’t mind sharing their stuff, so long as they’re asked about it first. 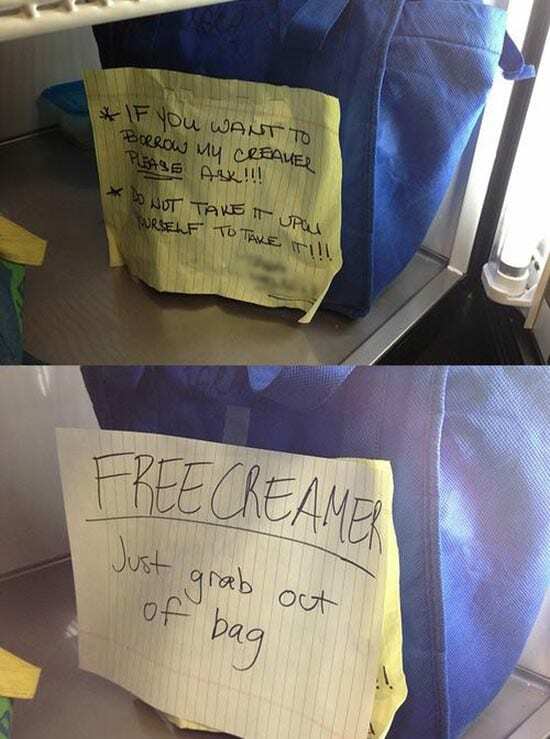 This employee is clearly willing to let others use their creamer, but they don’t like opening the fridge to find that people have already been helping themselves. 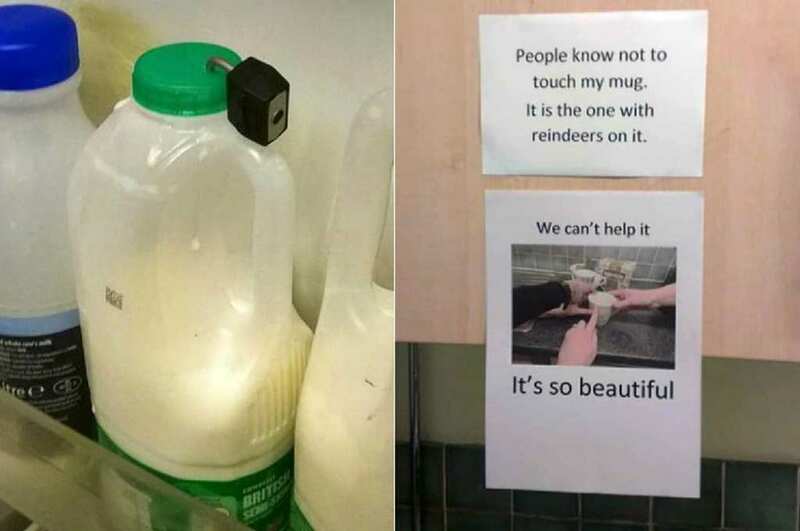 The person responsible for taking the creamer obviously feels differently about the matter and didn’t appreciate the note that their colleague left. They fought back with their own note, contradicting everything that was said and assuring other workers that the creamer was free to use. We see this ending in chaos. If your boss shows up to work with several boxes of Krispy Kreme donuts in hand then you know it’s going to be a good day. Providing your employees with a sweet treat is a great way to pick up their spirits and keep them motivated. Unfortunately, this boss clearly feels that their employees aren’t being healthy enough with what they eat. 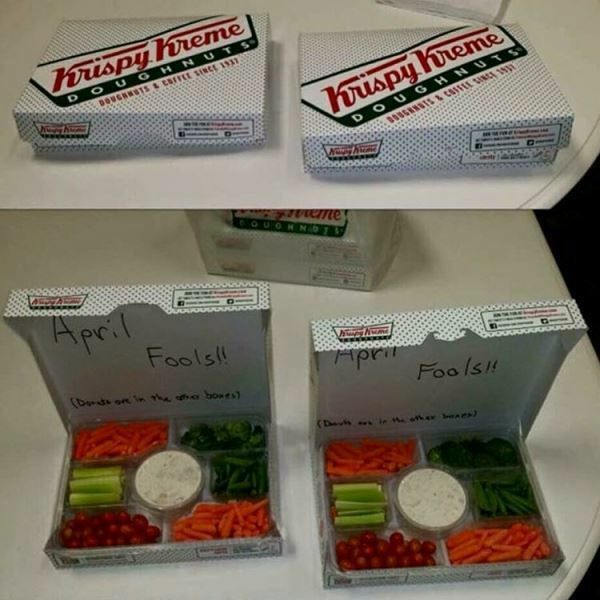 So, as an April Fool’s joke, they replaced all the sugary snacks with nutritious vegetables. What we want to know is what they did with the donuts that used to be in those boxes. What better way to get back at a colleague for eating your food than to make them believe they’ve contracted something from it. We suppose it’s possible that they could be being serious, but it seems more likely that they’re just trying to make the culprit paranoid about what they might have been infected with. If someone in the office starts panicking and keeps checking their mouth for sores, then they’ll quickly reveal themselves as the one responsible for stealing the food. Everyone will know who not to trust, then. 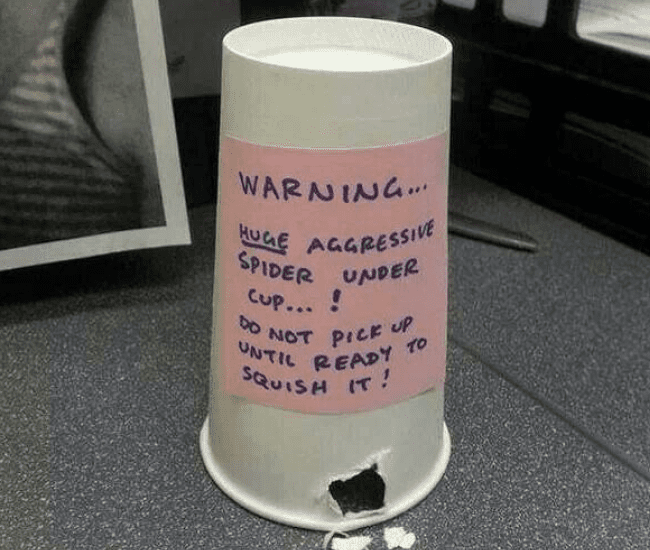 If you’re not afraid of spiders, then this office prank probably won’t affect you, but if you are… You wouldn’t catch us lifting this paper cup up, and we’d almost definitely be scanning the room in case there was a huge, aggressive spider on the loose. Even though rationally we’d be telling ourselves that this is a prank and our colleagues just cut that hole out themselves, we’d spend the whole day unable to focus on the job. You can always rely on other people at work to create some excitement, even if it’s at your expense. People at work love talking about the things they’ve watched recently, especially if it’s something that’s a favorite amongst others in the office. Of course, some colleagues can be a bit too eager to talk about the latest episode, even if everyone hasn’t gotten around to watching it yet. 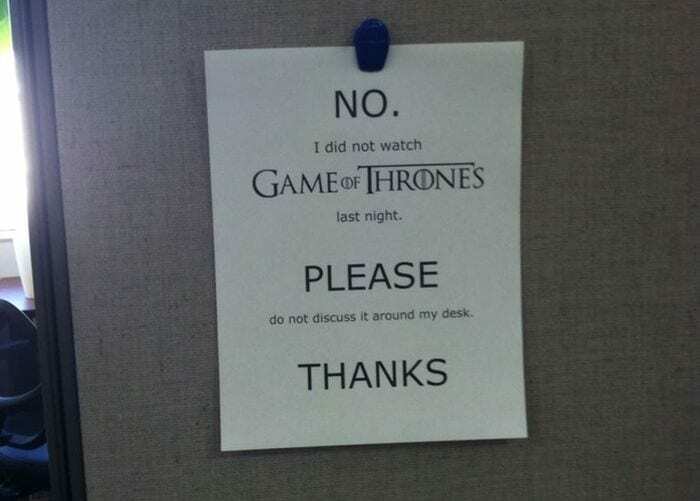 This worker took steps to ensure that their day would be spoiler free after missing the latest episode of Game of Thrones. Hopefully, people took note of this and kept away from their desk. Imagine coming back to your desk and finding this in its place. 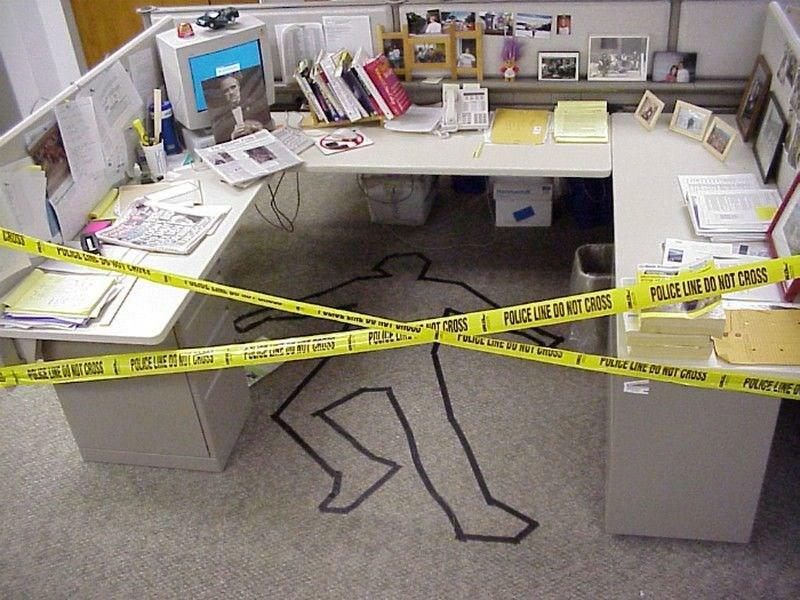 You might wonder who was killed right there in your cubicle, but you’re probably more worried about how you’re going to get your work done. Even if you’re sure that it’s just a prank, would you want to take the risk? There might be another explanation for this. 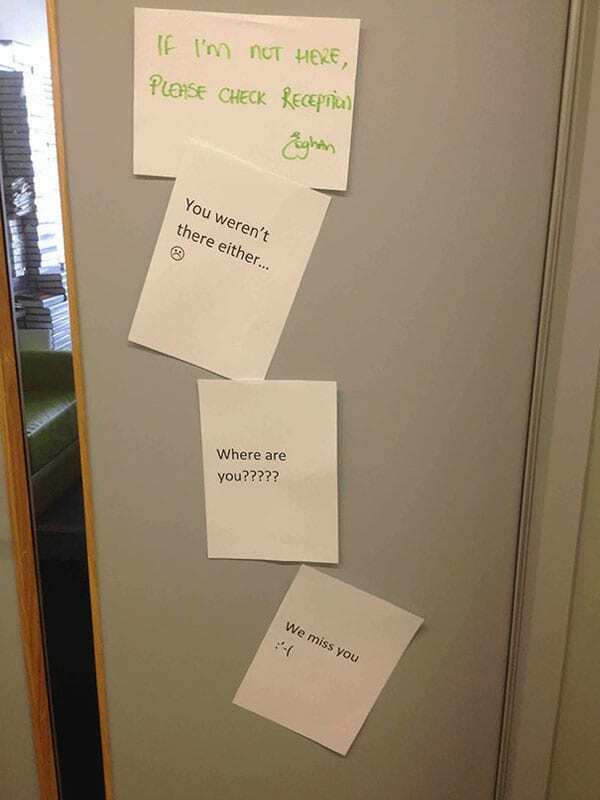 Perhaps this is the office’s idea of explaining their colleague’s absence while they’re away on vacation. It’s funny, so long as no-one actually believes it’s true. You can never have enough pens, and yet they always seem to go missing. Even though there are probably hundreds in the office, you seem to have a habit of all borrowing the same one because it’s the only one you can find. 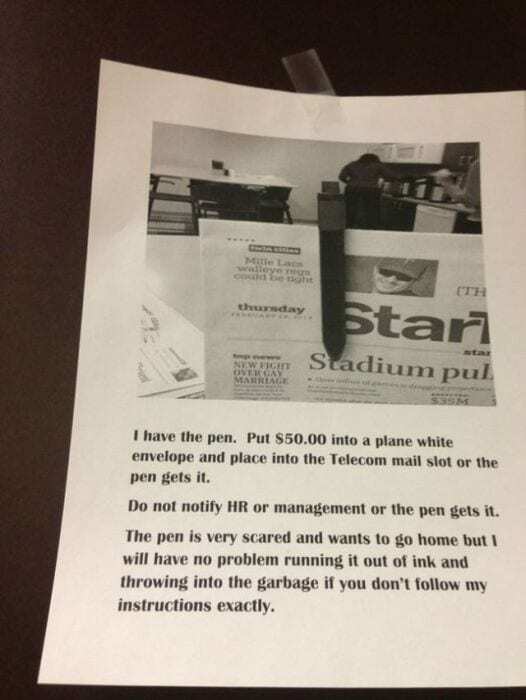 That’s why this devious employee decided to steal the pen and write up a ransom note demanding $50 for its safe return. We believe that they’d have no problem using up all the ink, but $50 is perhaps pushing it a bit too far. $45 is much more realistic. How does one become a knight?